The first Emperor of the New Germa­ny is one of those historical person­ages who, without possessing remarkable talents, are nevertheless called upon to act important parts, and upon whom their peoples, after the lapse of centuries, look back as political benefactors. He does not possess the gifts of his deceased bro­ther, is not, like him, keen and witty, a scholar and a connoisseur of art, but he has other qualities, and the very ones which Germany, on account of its inter­nal weakness, and its position between two powerful and ambitious military states, most needed, if it was to escape the fate of Poland. With his clear un­derstanding and firm will, his determina­tion, his spirit of self-sacrifice, his conscientiousness, his consistency in pursuing the objects set before his eyes, he is ex­actly the prince whom our country had to find in order to make Germany strong through unity, and to raise her to her proper place among the nations of Eu­rope. Freedom at home was not our first need, but freedom from foreign influence and restraint; the other, so far as useful and possible to a state like Germany, was sure then to follow and gradually devel­op itself. It is folly to cherish any fears in this regard. The Emperor William is, above all things, a soldier; he is the type of the Prussian officer. His spirit quickens the leaders of the army, and from them is transmitted to the lower ranks and the private soldiers. He is not a great gen­eral like his strategist Moltke; but he cre­ated the army which triumphed at Sado­wa and Sedan; his correct judgment se­lected and supported the men who knew how to manage the powerful machine so that it would work fruitfully in all its parts, and it remains to the present day the object of his most conscientious study and attention. He has indeed conquered; but he is without greed or lust of con­quest. He has only won what Germany had to win for her own security against envious and ill-disposed neighbors: good frontiers; a disposition of the ports to the best advantage of the whole in the inte­rior; and the extension of the Prussian military system over the whole people­ a measure which was required as much by a sense of equity as by political pru­dence. When this was accomplished, the man of war with the imperial crown transformed himself into the most pacific monarch which the world has seen in this century. "I see in a single day an edifice de­stroyed on which great men have labored for two centuries. There is no longer a Prussian state, a Prussian army; no long­er any national glory. Oh, my sons, you are of an age when your minds can appre­ciate and feel the great events which have overtaken us. In the future, when your mother no longer lives, call this unhappy hour up in your memories. Shed tears over your mother's memory, as I now weep over the prostration of my country. But do not be satisfied with tears. Act; develop your powers. Perhaps Prussia's protecting spirit .may descend upon you; then deliver your nation from the shame, the disgrace, the debasement, under which it now suffers. Strive to re-conquer from France the glory, just now obscured; of your fathers, as your ancestor, the Great Elector, avenged upon the Swedes at Fehr­beIlin the outrages committed against his father. Let yourselves not be carried away, my princes, by the degeneration of this age. Be men, and strive for the name of soldiers and heroes. If you wanted this ambition, you would be unworthy de­scendants of the great Frederic. But if with all your efforts you fail to raise up the fallen state, then seek death, as Louis Ferdinand sought it." "This belief will elevate and strengthen me. I believe firmly and steadfastly on Him who says to the presumptuous, thus far and no farther; here shall thy proud waves be stayed. The dawn of a better day breaks. I hope with joyful confi­dence that the almighty and gracious God will be with my royal father, his house, and his faithful people." This faith accompanied the Prince as, by his father's side, he took part in the two campaigns of the war of liberation. Near Mannheim he was present for the first time at a fight with the French; in the battle of Bar-sur-Aube he won by his gallant conduct his first military decora­tion, the Russian Order of St. George; and at La Fere Champenoise he carried, through the heaviest artillery fire, the order to press forward and fire with car­tridge. "I take pleasure in my high station, not on account of the distinction which it gives me among men, but because in it I can work the better and accomplish the more. My rank ought always to remind me of the great duties which it imposes upon me, the great exertions which it re­quires of me, and the great temptations against which I have to battle. I will never forget that a prince is also a man, and before God only a man, sharing with the meanest of his people the weakness and the wants of human nature; that the ­laws which control others are written likewise for him; and that he, like others, will one day be judged according to his conduct. I know what owe, as a man and a prince, to my honor. Never will I seek it in things where only mad­ness can find it. My powers belong to the world, to my country. I will there­fore be unweariedly active in the sphere ­assigned to me, employ my time in the­ best manner, and accomplish as much good as lies in my power. I will main­tain an honest and hearty goodwill to­ward all men, even the humblest, for "they are all my brothers. I will use my dignity as a prince to the disadvantage of nobody, oppress nobody by my own supe­rior facilities; and when I have demands to make of anyone I will be gracious and friendly, in order to render the execution of the demands as easy as possible. I esteem it much more highly to be loved than to be feared, or merely to enjoy the­ consideration of a prince. Flatterers I will firmly repel. The best, the most open, the most sincere, shall be the most. welcome to me. I will hold those to be ­my best friends who tell me the truth, even when it may seem likely to displease­ me." These principles were not simply writ­ten down; they have been realized in life. They adorned the Prince, and became the daily guide of the King; they made him great; they won and preserved for him the love of his people. In obedience to them he has always taken his mission strictly and earnestly, first as soldier, then as ruler. In 1817, having carefully prepared him­self for the post, he received a seat and voice in the Council of State. Still for ­a long time the military rather than the civil service claimed his attention. Hav­ing already during the war reached the rank of major, he became successively during the following ten years of peace colonel, major-general, and (1825) com­mander of the Third Army Corps. In his youth somewhat delicate, he became, three­ years later, at which time he married a princess of Saxe-Weimar, the present Em­press Augusta, a vigorous and stalwart man. "Prince William," wrote Gagern at that time to Stein, "is the noblest fig­ure that can be seen, the most imposing of all; besides that, he is comely and chiv­alrous, spirited and gallant, yet always with dignity." After the accession of his brother to the throne, the subject of our sketch, who thenceforth bore the title of "Prince of Prussia," applied himself more than for­merly to civil affairs. In 1840 he was appointed Governor of Pomerania, and two years later, during the absence of his brother in England, the conduct of all military and civil affairs was entrusted to him. In 1844 the Prince himself made a journey to London. Bunsen wrote of him then: "The Prince is greatly taken with England; he admires her greatness, and perceives that it is the consequence of her political and religious institutions." When the insurrection of March, 1848, broke out in Berlin, and the weak King yielded to the demands of the democrats, the Prince was understood to disapprove, and to lean toward reaction. The first supposition was certainly unfounded. He was at the time again in England, and Bunsen says of him, in a letter to Dahl­mann: "Is the Prince an absolutist or re­actionist? That he is thoroughly honest, open, and consistent even the ill-disposed have never denied, if they speak with any knowledge of the man. In the very first days, and with the quick yet firm intelli­gence which is peculiar to him, he reveal­ed a perfect clearness of view in regard to his own and Prussia's situation. The exchange of ideas with Peel, Russell, Palmerston, and, above all, Prince Albert, has made past and future only clearer." Recalled by the King, he wrote to him on the return journey: "I cherish the hope that the free institutions, to the firm organization of which your Majesty has summoned the representatives of the peo­ple, will gradually develop themselves, with God's gracious aid, to the welfare of Prussia. I shall devote to the service of this development, with confidence and loy­alty, all my forces." And in the Prus­sian National Assembly he declared, a lit­tle later: "The constitutional monarchy is the form of government which our King has introduced. To it I consecrate my powers, with the conscientiousness and the fidelity which the country has a right to expect from my well-known char­acter. This is the duty of every patriot, especially mine, as the first subject of the King." The National Assembly called by the King went so far in its demands that to govern with it was impossible, and its dis­solution became necessary. The Prince approved this decision. He had previous­ly declared that the rights and franchises of the people must be held sacred, but not at the cost of the rights and powers of the crown; that order and law, not anarchy, ought to rule. In the summer of 1849 the Prince com­manded the army which was sent to put down the insurrection in Baden and the Palatinate, and in the period of six weeks this task was fully accomplished. The same year, in October, he was appointed military governor in Westphalia and on the Rhine, and changed his residence from Berlin to Coblentz. In 1854 he became gov­ernor of the federal fortress of Mayence, and was simultaneously made colonel-gen­eral, with the rank of field-marshal. The reaction which in consequence of the ex­travagance of the liberals had set in Prussia failed also to keep within the bounds of moderation, and was guilty of many coarse excesses against the press and the new institutions generally; and in ec­clesiastical affairs its pressure was heavily felt. The Prince did not sympathize with this policy; and, as this was soon known, it produced a revolution in the public senti­ment toward him. He who had hither­ to been counted among the friends of the past and the advocates of a return to absolutism, passed thenceforth for a moder­ate liberal; so that when after 1854 the rivalry between Prussia and Austria be­came keener, and the former began better to understand its mission in Germany, to respond to the national expectations - the impulse being given by Bismarck, at the time Prussian envoy in the federal As­sembly - Prince William was recognized as the silent head of the party which was striving for the regeneration of Germany under the lead of the state of the Hohenzollerns. Accordingly, when his brother, King Frederic William IV., was taken ill, and it became necessary to appoint a re­gent, who, his Majesty having no chil­dren, could be only Prince William, the heir presumptive, the hopes of all German patriots were centered in him. The justice of these hopes was vindi­cated; a revolution took place in the home and foreign policy of Prussia. The Regent dismissed the existing reactionary cabinet, and appointed men of moderately liberal views. At the same time, in a re-script of November 8, 1858, he made known his political principles and aims. He there declared, it is true, that there could be no discussion about a rupture with the past, but promised "to apply a reforming hand wherever the arbitrary or the inadequate still showed itself." "What has been promised," continued the re-script, "must be religiously performed; what has not been promised, firmly prevented. Above all, I warn the public against the stereo­typed phrase, 'The government must con­tinue steadily to develop liberal ideas, other­wise they will open their own road. If in all its acts truth, legality, and consistency speak, a government is strong, because it has a clear conscience, and with this it is possible to resist firmly every form of evil." Passing to the subject of the Church, the Regent observed: "In the Evangelical Church an orthodoxy has in­truded which is not reconcilable with its essential spirit, and has hypocrites in its train. All phariseeism, all ecclesiasticism, if merely means to selfish ends, should be rooted out wherever possible." Then further: "The army has accomplished great things for Prussia; the neglect of it brought upon us a great catastrophe, which has been gloriously wiped out by the opportune military reforms that the victories of the war of liberation made possible. An experience of forty years and two brief war episodes (Baden and Schleswig-Holstein) have nevertheless con­vinced us that many things which have not justified themselves by trial need amendment. To this end are required political calm and money. It would be a fatal error to be satisfied with a cheap military establishment, which, in the hour of danger, would disappoint our expecta­tions. Prussia's army must be strong and able to command respect, in order, when it becomes desirable, to throw a heavy weight into the balance." Finally, com­ing to the German question, the Regent declared: "In Germany Prussia must make moral conquests through a wise le­gislation at home, the recognition of all ethical forces, and the seizure of elements of union, like the Zollverein. The world must learn that Prussia is ever ready to protect the right. A firm, consistent, and energetic conduct in politics, aided by pru­dence and good sense, is sure to gain for Prussia the consideration and the influ­ence which it would not be able to com­mand through its physical means alone. "Of these passages of the re-script, that which was directed at the hypocrisy of clerical reaction, and that which explain­ed the attitude of the Regent to the German question, found hearty applause among the people, and in the newly elect­ed liberal House of Deputies; that which set forth the necessity of military reforms, and of money to carry them out, found, on the contrary, no appreciation, but rath­er distrust, among the short-sighted and narrow-minded Deputies. In this mea­sure the Regent saw, however, his first and most important task - an opinion which the events of the year 1859 were only cal­culated to strengthen. Unfortunately the popular representatives were in this matter unable to shake off their preju­dices and suspicions; and in 1860 they refused to authorize the expenditures for the reorganization and enlargement of the army, which had in the mean time been begun. Full of doubt and impatience, they wished first to have practical evi­dence of an energetic and fruitful policy before their eyes, not considering that, without a strong army, energy could not be displayed. The discontent of the liberals increased. A fanatical young man, the student Beck­er, saw in King William - for he had just ascended the throne on his brother's death - an enemy of freedom, and July 14,1861, on the promenade at Baden-Ba­den, made an attempt to shoot him - an at­tempt which happily effected only a slight wound. The style and manner in which the King caused himself to be crowned, in October of the same year, at Konigsberg, strongly emphasized the principle of le­gitimacy, irritated the radicals, and made them the more suspicious of his purposes. In view of this feeling it caused no sur­prise when the next elections went in fa­vor of the opposition; and when the King suffered the nerveless and incapable "min­istry of the new era" to fan, because it failed to procure the approval of the Diet to the scheme of army reorganization, there began the momentous four years constitutional conflict, which did not reach its end until the King and Bismarck, his new Premier, had shown the skeptics on the battlefields of 1866 why the army had been reorganized, and what it could ac­complish. In the interval King William, although the rapid decline of his popular­ity closely touched him, held steadfastly to his purpose, and supported the Bismarck cabinet, hated as it was, with all his au­thority. I subjoin a few of his utterances, which will show his loyalty to the consti­tution. In the speech from the throne of Jan­uary 14, 1862, he said: "The development of our institutions must be made to serve the strength and greatness of the country. I can never consent to see the progressive unfolding of our state life endanger the rights of the crown, the strength and se­curity of Prussia." In a re-script dated March 19, and addressed to the ministry, it is said: "It is my duty and my firm in­tention to maintain the constitution and the rights of the representatives of the people, according to my oath, in all their integrity; but, at the same time, to vindi­cate and preserve unimpaired the rights of the crown, which Prussia needs for the execution of its mission, and the weaken­ing of which would involve the ruin of the country." On the 13th of October Bismarck de­clared, on closing the session of the Diet: "The government would be guilty of a grave neglect of duty if the reconstruc­tion of the military establishment, begun on the strength of former grants of the Legislature, should now be abandoned, with the sacrifice of previous outlays, and at the cost of Prussia's interests, because of a vote of the House of Deputies. We find ourselves obliged to provide for the expenses of the government without that legislative authorization for which the constitution provides. We are fully con­scious of the responsibility which this un­fortunate state of things imposes "upon us; but we also remember the duty which we have toward the land, and in that we find our authority for making, without the sanction of the Diet, the outlays which are necessary to the maintenance of the existing institutions of state, and to the furthering of the public welfare, feeling sure that eventually they will receive the constitutional ratification." The King's theory in regard to the jus­tification for a budgetless regime was set forth in the re-script of February 3, 1863, in reply to an address of the House of Deputies: "The address characterizes the control of supplies as the supreme right of the representatives of the people. I recognize this right, and shall ever in­sist that it be observed, so far as it is con­tained in the constitution; but I must call the attention of the House to the circum­stance that, according to the constitution, the members of both Houses of the Diet represent the people, and that the annual budget can be authorized only in the form of a law that is a concurrent resolution of both Houses duly approved by me. Is such a concurrence unobtainable, then it becomes the duty of the government to see that in the mean time the administra­tion goes on without disturbance. It would have failed in its responsibilities if it had not done this." At the close of this re-script the King, while emphasizing his own efforts and sacrifices for the sake of harmony, calls upon the Deputies to meet the government half-way, "since a reconciliation is for him a heartfelt want." All in vain. The majority of the Depu­ties held stubbornly to their pretended rights, and the conflict became from ses­sion to session more bitter and more vio­lent. In such circumstances the internal reforms came to a full stop; but in the German question the King followed, un­der Bismarck's bold and sagacious guidance, a very decided policy. He declined an invitation to take part in a congress of German princes at Frankfort, since it evi­dently contemplated a reform of the con­federation under Austrian auspices, and promised no adequate representation of the people. In alliance with Austria he began a war for the release of Schleswig-Holstein from the tyranny of the Danish democracy, and conquered the duchies for Germany. Finally, setting aside his le­gitimist theories, he entered upon the war against Austria and her allies, in order to bring about a reconstruction of German affairs, which was absolutely necessary, but could not be effected by pacific measures. Like Charles Albert of Sardinia, he risked much, but he was more fortu­nate than he, because better prepared. The Prussian army, remodeled by him in spite of the opposition of the Diet, was everywhere victorious, and in seven days the greatest revolution which Germany has ever seen was entirely accomplished. But the victory was used with modera­tion. From the conquests only the abso­lutely necessary was retained. The King wished to annex Austrian Silesia, North Bohemia from Reichenberg to Eger, to take from Saxony the Lausitz, and from Bavaria the northern part, which had once been in possession of his house. Bis­marck advised that only so much be tak­en as was necessary: he had in view an early understanding with Austria and Ba­varia, and did not wish to make them ir­reconcilably hostile through loss of ter­ritory. The King suffered himself to be convinced, and gave up the fulfillment of his wishes. Returned home, he showed himself in internal politics equally ready to follow the advice of his minister, and to offer the hand of reconciliation to the House of Deputies, by authorizing him to ask indemnity for the past. Surrounded by the halo of a great victory, borne aloft on the enthusiasm of an immense major­ity of the people, brilliantly vindicated in respect to his new military creation, he needed no indemnity, and could perhaps have overthrown the whole constitutional system in Prussia without running any serious risk. He preferred the other way, and proved thereby that his views were moderately, indeed, yet honestly, liberal. The larger number of the Deputies re­spected this line of conduct, and harmony was restored between monarch and peo­ple. The fruit of his moderation toward the South German states was a secret alli­ance, offensive and defensive, between the newly founded North German Confederation and those states-a treaty which proved later to be of service. By the constitution of the North Ger­man Confederation King William became President of this union of the larger part of the German states. In Prussia as in German affairs he and his minister went as far as possible hand in hand with the moderate liberals; and the completion of the new institutions, in which the life of the nation was thenceforth to develop it­self, united and powerful, was greatly ac­celerated by the harmony which followed from the happy compromise. The cab­inet of the King also received a more lib­eral character, and at the same time a larger element from the bourgeoisie, as one after another the ministers who had made themselves hated during the "con­flict" were replaced by statesmen of more reasonable views. Bismarck remained at the lead of the affairs of Prussia and of the Confederation. Not only gratitude moved the King to continue to govern with his aid, but also the conviction that his genius was absolutely indispensable. He above all others had planned and car­ried out the work of union; he alone pos­sessed the sagacity to preserve it diplomat­ically against foreign dangers, and in the interior to keep it firm and fruitful of blessings. That the King recognized this, and supported, though sometimes hesi­tatingly, the reforming schemes of his Chancellor, is one of his most noteworthy virtues. It must often have been far from easy for him to yield. The Emperor Napoleon had not seen with pleasure the issue of the war of 1866. He had expected from it some advantage for France, and it had not come; He re­garded with uneasiness and jealousy the growing power of Germany, which was not withdrawn from the old influence of the West, and as early as 1869 he began to prepare for war. The election of a Hohenzollern as King of Spain furnish­ed him with a pretext. Although King William showed himself conciliatory in the affair, and responded to the wishes of France as far as was consistent with his honor, the latter grew more and more ex­acting, and at length presented grossly humiliating and impossible demands. By Bismarck's advice they were refused, and the Emperor of the French declared war on the King. He saw all Germany in arms against him; from the Baltic Sea to the Bavarian Alps, the suddenly reunited nation roused itself; its armies hastened to the frontier; the King followed to take the chief command against the hereditary foe; battle after battle, ever greater and bloodier, was fought and won by the Ger­mans, and at Sedan the Emperor Napo­leon, hitherto the all-powerful dictator of Europe, laid his sword, as a prisoner, at the feet of the King. Paris also fell finally, after a long and brave defense, and at Versailles the new German Empire was founded. The peace restored to the Ger­mans all the lands of which in the time of their discord they had been robbed by the ambition of France, and with them a good frontier, a strong wall against this ambition. It was the greatest and grand­est time that Germany had seen for cen­turies; the joy over their victory in a most righteous war resounded through the whole broad land, and found an echo in the most remote backwoods of Amer­ica, where German hearts beat and the German tongue was spoken. The Ger­mans in America lived far from the bosom of the mother; they were republicans; but they were sensible that our blood ran in their veins; they were "our kin across the big water," and they reveled in the glory with which God had surrounded their brothers in the old country. The ravens flew no more about the Kiffhiiuser. The old Kaiser in the mountain was re­leased; but the new Kaiser might have said to himself, on the occasion of his tri­umphal entry into Berlin, June 16, 1871, that the foresight and the persistence with which he had labored to arm first Prus­sia and then the entire father-land had been not the least of the causes of the suc­cessful issue of the terrible struggle. The Emperor William had begun his career as an enlarger of the empire; he declared that he would continue it as guardian of the peace, and kept his word, to the advantage not only of his own people, but also of Europe, by using his best efforts and those of his Chancellor to rec­oncile differences, allay animosities, and prevent collisions between neighboring states. With this object in view he brought about, in September, 1872, the triple alliance, which was to unite Ger­many, Austria, and Russia in the bonds of friendship, and especially to effect a rapprochement between the last two pow­ers. 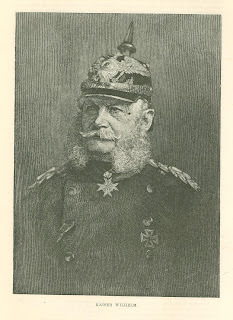 The same purpose was served by the visits which he made in 1873 to St. Peters­burg and Vienna, and in 1875 to Milan, and by the policy of Germany in the Ber­lin Congress, which aimed to modify the demands of Russia, after her victory over the Turks, in such a way as to make them reasonable without threatening the inter­ests of England and Austria. The vanity of Gortschakoff and the fantastic aspirations of the Muscovite panslavists were not satisfied with this policy. A keen irritation against Germany took posses­sion of that class; war preparations were heard of in Western Russia; there were rumors of attempts on the part of the Russians to gain France for an alliance against the two middle European states. This was the moment for Bismarck to carry into execution a long cherished and well prepared plan, namely, to restore the connection with Austria, so far as it was desirable, and to establish a firm alliance between the two states for the defense and maintenance of the peace of the world. The Emperor William was at first averse to this policy. He was influenced by the most amiable considerations; he was held to the Czar by the bonds of personal friendship, and long hesitated to affix his signature to the compact for which the Emperor Francis Joseph was eager. In the end, however, sentiment gave way before a calm study of the situation, the in­fluence of the somewhat doubtful Russian assurances of friendship before considera­tions for the welfare of Germany. He yielded to the representations of the Chan­cellor, who in this matter saw further and thought clearer than he, and an alliance was closed - an alliance which not Eng­lish voices alone greeted with the words, "A great blessing has befallen the world" - words which received more weight in 1883 by the adhesion of Italy to the power­ful league of middle Europe. If Kaiser William bore after 1871 the olive-branch in the laurel wreath, it was above all the case in respect to his foreign policy. In home affairs the restless ener­gy with which he applied himself to affairs had indeed rich results to show; the military organization of the German Em­pire on the Prussian model was carried through, and the reform of the Prussian administrative system also made progress. But soon after the war with France, began the war with Ultramontanism, the so-call­ed "Culturkampf," which was not directed, as alleged, against the freedom, much less the existence, of the Catholic Church in Prussia, but against the efforts of a par­ty dominant in that Church, and aided by an infallible Pope, to abridge the freedom of the state, and according to the princi­ples of the Syllabus to banish free thought, with its consequences, from society and the schools. As in everything else, the Emperor supported his ministers also in this conflict loyally and with strict legality, and neither the threats nor the flattery of the clericals, neither the intrigues of a party of court" bonbonniere" favorable to them nor the pressure of a very exalted lady seeking in the guise of an angel of peace a voice in the government, were able to seduce him from this path. Yet he showed himself ready to give his sanction to Bismarck's change of front, when the Chancellor saw that the new Pope was of a conciliatory disposition, and that the measures which had been taken against the aggressions of the Ultramontanes could be modified without injury to the state; for his chief desire was the welfare of all his subjects, and the Church and the worship of the Prussian Catholics had in truth suffered under the Falk laws. Another contest arose in 1877. Up to that time occupied above all things with questions of foreign policy, Bismarck found time then to study two great do­mestic problems, and to undertake their solution. Germany's industry had suffer­ed greatly under a system of legislation inspired by extreme free-trade principles, and demanded protection against the pow­erful competition of foreign countries. At the same time it was desirable to place the empire on an independent footing as re­gards finance by means of rich revenues to be derived from the tariff and the to­bacco monopoly. On the other hand, the Socialist movement, which had been started by the laboring classes in Ger­many, and in spite of restrictive laws was daily gaining ground, demanded measures which should serve to improve the condition of and to pacify the workingmen. Their lot was to be made easier, their future made secure, through a system of insur­ance against accidents and decrepitude, as well as through invalid funds; they were to learn that the state had a heart for them, and instead of simply exacting tributes in money and blood, would also give them aid and sympathy in the struggle for existence. The invalids of the manufactories were no more to be suffered to go to ruin than the invalids of the army or the civil service. That was Christian and also politic, for it was hoped that by such laws the empire would win millions of hearts which were bitterly hostile to it, and expected relief only from a cosmopolitan revolution. The Imperial Diet showed little friendliness to­ward these projects of the Chancellor. It contained many fanatical free-traders, and many who feared that the tax and tariff reform would abridge in some way the parliamentary control over the budget. The state should not become strong by coming forward as a benefactor of the poor, should not interfere at all in eco­nomical questions. Strong opposition from the liberals followed, therefore, when the government refused to grant the desired constitutional guarantees, and to make certain of their leaders minis­ters. A large part of the liberals which hitherto had generally supported the gov­ernment went over into the camp of the opposition; and the struggle over the above described question took on more and more the character of a contest about the line of division between the power of parliament and that of the crown. The reform of the tariff was carried through with the aid of the clericals; but the oth­ers were checked, and the new elections re­sulted on the whole unfavorably for the government. In this struggle the Emperor-King­ stood throughout on the side of his Chan­cellor and minister. This he often pro­claimed in the most solemn manner be­fore the nation, especially in regard to the social political views of Bismarck. The Emperor William is a man of large stature, imposing figure, and regular and friendly features. A strictly regulated activity, and simple, temperate habits have preserved in him in his advanced age a rare physical vigor and an uncommon in­tellectual freshness. He is little bent as he walks, and at parades or manoeuvres can even today be seen sitting erect many hours in the saddle. If he has shown great moral courage in various situations, he has likewise proved - and as an old man - that he possesses the physical cour­age of the soldier. At Sadowa as at Gravelotte he rode dauntlessly up to positions upon which the hostile shells rained, and was only persuaded by his. suite with great difficulty to retire. " Sim­ple, honest, and sensible, "thus his mother­ characterized him in the year 1807, and thus he grew harmoniously to manhood. He is not animated by a strong interest for the efforts and creations of art or science, and shows a penetrating know­ledge and an independent judgment only in military and political matters. To the characteristics already mentioned should be added his moderation in prosperity, his modest estimate of his own services as compared with those of his subordinates especially Bismarck and Moltke, and his high conception of his public duty, which teaches him to regard the welfare of the state and people entrusted to him as the chief object of his thoughts and actions, and not only to bow in special cases be­fore the law, but even to sacrifice long­ cherished views and projects to the obliga­tions which his high office imposes upon him. The private life of the Emperor flows. along very simply. When in Berlin he occupies a comparatively small palace on the corner of Unter den Linden and the Opera Place, his presence being made known to the Berliners by the red flag with the Landwehr cross, which is then hoisted over the roof. The window of his study on the ground-floor looks out upon that point in Unter den Linden, where Rauch's statue of Frederic the Great stands. Ordinarily the Emperor rises between six and seven o'clock in the morning. He dresses at once completely for the day; the convenience of dressing ­gown and slippers is unknown to him. The room to which, after a slight breakfast, he goes for work is rather plainly furnished. There is a mahogany writing­ table, covered with writing materials of every kind, packages of letters, small pre­sents from members of his family, and mementos of battles in the form of paper­weights. Smoking implements fail, for the Emperor is no friend of tobacco. On a long and broad table nearby lie books, maps, bundles of documents, and papers of various kinds. The Emperor sits at his work on an ordinary chair covered with leather, and receives personally all communications, opens them himself, writes his decision on the margin, and hands them to his secretary to be disposed of. One of his peculiarities is his econo­my in the use of paper and envelopes. In Versailles one evening he announced a new victory of the Germans to the Chan­cellor on a piece of paper which had been torn from a letter. In Berlin the envel­opes which reach him with reports from the Foreign Office addressed, "To his Majesty the Emperor," go back with the "to" erased and "from" substituted so that the envelope reads, "From his Ma­jesty the Emperor," with "To the Chan­cellor" written beneath. The Emperor's extraordinary capacity for work makes it possible for him to dispose, as a rule, personally of the affairs connected with his office, or at least to direct their disposi­tion in his own way. Upon his rustic castle at Potsdam the Emperor has expended more than upon his city residence in Berlin. Potsdam, with its groves and parks, its contrasts of wood, meadows, gardens, and especially the Havel inlets, which look like great mirrors in settings of hills, is one of the most beauti­ful points in Brandenburg-nay, in north­ern Germany; and Babelsberg, the Tus­culum of the German Emperor, is perhaps the most charming corner in this paradise, so gracefully favored alike by nature and art. Its owner spends, how­ever, only a few weeks each winter here, although the castle can be reached in less than half an hour from the railway. The greater part of his time is passed in Ber­lin, which is the seat of the central gov­ernment and the Diet. Wiesbaden, Ems, and Gastein are his favorite health re­sorts. Grand hunting parties sometimes take him away, for he is a friend of the chase, arid even yet is a skillful and lucky sportsman. But the days which he passes at Babelsberg, resting from the fatigues of his position, are especially helpful to him. The Emperor William is a great friend of the corn-flower (the bachelor's-button). In regard to the cause of this preference the following old and pretty story is told: "One day - it was at Konigsberg, and in the gloomiest period of Prussia's history - the Queen Louise sat in the gar­den of the house on the Hafen, which the royal family then occupied, when a young girl approached, and, without know­ing whom she had before her, offered a bouquet of fresh corn-flowers for sale. The Queen, full of sympathy, spoke kind­ly to the thinly clad child, and learned that she had a sick mother at home who could earn nothing. She thereupon, with tears in her eyes, took the flowers from her, rewarded her generously, and then called her children, who were playing nearby. She showed the Princess Charlotte, afterward consort of the Czar Nich­olas of Russia, and the Prince William, how a wreath could be made of the flow­ers without shears, called the attention of the children to their simple beauty, and then drew the moral that in nature, as in human character, plainness and simplicity coexisted with beauty. This lesson, taught by the royal mother in such a graceful form, together with the pretty wreath, which she finally placed on the head of the Princess Charlotte, made the blue cyan the favorite flower of the future Empress of Russia and her brother, the present German Emperor; and when, a few years later, the Queen died, the corn­flower became for both a memento of their sanctified mother. When, in the year 1817, the Princess, in company of her brother William, journeyed by way of Konigsberg to St. Petersburg as the bride of the Emperor Nicholas, she found her room in the castle of the first - named city richly decorated with corn-flowers; and as they both crossed the Russian frontier the Princess wore on her head a wreath of such flowers, which had been handed to her at the last Prussian station. If we now look back over our recital, and consider once more particularly the political character of the Emperor Will­iam, we see in him a prince who, never for­getting the obligations imposed upon him by the Prussian and German constitutions, has kept strictly within the bounds of le­gality, but is quite as little as Prince Bis­marck a friend of parliamentary absolu­tism, which, for the rest, is not to be found in those constitutions. The parliamentary regime, the successive rule of two great parties, has arisen in England naturally, is equitable and useful. But it is not therefore a panacea for all nations. The relations and circumstances on the continent of Europe are, at least as yet, essentially different from those upon the group of islands which compose the Brit­ish Empire. Germany's situation per­mits perhaps less than that of any other great state of the Continent a serious cur­tailment of the monarchical power; and that the Prussian constitution contains no such curtailment is, as Bismarck de­clared to the opposition in the Imperial Diet two years ago, a great good fortune for Germany. Reflect, said the Chancel­lor, in substance, on this occasion, that if the case were otherwise there would now be no German Diet. If King William had interpreted the constitution from 1860 onward as the liberal majority understood it; if, accordingly, he had continued to follow the foreign policy of the two pre­decessors of Bismarck, and to choose min­isters who would represent and carry out the views of each successive parliamenta­ry majority, then the reorganization of the Prussian army would never have been carried through. For the then liberals had no conception of what was alone pos­sible and politically right in the German question; that is to say, they had not convinced themselves that in order to be able to restore German unity a strong Prussian army was indispensable. Instead of will­ingly granting the King the necessary sup­port, a majority of the Diet opposed most desperately his efforts to create a military force, with which German unity could not only be restored, but also defended in bat­tle against foreign foes; and if the King had not then remained firm and carried out his plan, Germany would today be as bad as it was before 1866 - nay, in all probabili­ty even worse. Furthermore, if King William had not been in a position to enforce his own policy in 1863, but had been compelled to follow that of the Diet, Prussia would have neces­sarily taken sides with the Polish insurrection, and against Russia, which would thenceforward have been our enemy, have hindered and disturbed our German plans by every means in her power, and prob­ably have joined France in an attack upon us. It was in no sense merely from fam­ily affection for the Czar, or from admira­tion of the Russian governmental system, that the King acted contrary to the wish­es of the liberals, who felt sympathy for the Poles simply because they were re­sisting a government. Russia ought rath­er to be conciliated, put under obligations of gratitude, and made a good neighbor in future wars; and this policy approved it­self in 1866 and 1870 as perfectly sound. It would have been our ruin if the Diet had then had the right and the power to compel the adoption of the opposite policy. Finally, to mention one more example, if things had gone according to the will of the majority in parliament in the Schleswig-Holstein question of 1864, the King would have been forced to put him­self at the service of the small German gov­ernments which represented the Confeder­ation - that is, state rights - and sought to elevate Duke Frederic of Augustenburg, a supporter of their aims and pretensions, to the throne of the duchies. For that, and nothing else, was then the leading opinion in the Prussian House of Depu­ties. If that opinion had prevailed, Prus­sia would have executed in the service of the Frankfort majority a decree of the Confederation, and with its own means have created a new enemy on its flank. The proceedings of the Prussian House of Deputies at that time seem now almost incredible, so great was the blindness of the liberals toward what the interest of the land clearly and plainly demanded. Had the King yielded, and the Diet carried its point, the shrewd plan of Bismarck to win Austria for common action with Prussia in the matter of the federal project would have been defeated of its results. It would have been necessary to give up the trans­action with the Vienna cabinet, to aban­don the idea of a joint campaign of the two great powers, and to carry out the federal decree without any other reward than a certificate of merit from the Presi­dent of the Confederation. The Confed­eration would have been strengthened, would have existed even today, to the great injury of Germany, and would prob­ably have a better prospect of continued life than at any time since its foundation. Still greater was, however, the probability that Prussia, adopting this course without Austria, would have been restrained by the other European powers, and have been reduced by the Federal Diet to the inevi­table fate of experiencing a second Olmutz. The absurd scene on the Eschen­heimer Gasse in Frankfort would have continued, amid the laughter of Europe, and to the shame of the nation, and of a German Diet there would be even today no question except in dreams. It was therefore no disadvantage, but a blessing, that King William held firmly to his own policy, although it was supported by only eleven voices in the House of Deputies, and that he resolutely followed the tradi­tions of the Hohenzollerns, and the line of conduct which his German instincts and his patriotic heart set before him as the true ideal. He said at the time to Bismarck, who seemed at first not to view the Holstein question with German, with national, eyes, "Are you, then, not also a German?" and in truth, though appear­ances might be otherwise, the views of the King were directed in this, as in other af­fairs; toward the greatness and welfare of Germany, toward strengthening it through union. He changed his advisers until he found a ministry which understood him, and was ready to carry his purpose into execution, to cut loose from the scruples of former governments, and to support a national policy that was about to draw the sword and cut the Gordian knot. King William, the German Emperor, created and recognized our constitutions by giving them his approval. He has faithfully observed them, has always ruled constitutionally; but he has never con­sented to be a mere royal figurehead, ­without any will of his own, and in whose name ministers govern who are mere creatures and servants of the majority in parlia­ment. He will not let himself be meta­morphosed into a mere principle, but is determined to be a living prince, standing in direct relations to the people and its rep­resentatives. The great majority of Prus­sians are accustomed to this, and demand nothing else. "What we have" - thus Bismarck closed one of his great parliamentary speeches­ "we owe not to parliamentary but to roy­al measures. For that reason we should be the last to assail that vital correlation between King and people as it has always, and never to the injury of the land, ex­isted in Prussia. On this basis the king­dom has become so great and strong that you, gentlemen" (he turned at these words toward the Left), "are unwilling to come into immediate contact with it, but desire to have royalty concealed behind a cur­tain. But when we see what monarchy has done for us, we should strive to fur­ther, to cherish, to animate it, not to suf­fer it, as it were, to become obsolete through disuse. Everything which is put away in a closet and not used loses the quality of usefulness, and so it is with the, for Prus­sia, indispensable monarchical principle. If that be taken from us, what can the gentlemen put in its place? If this strong King, so deeply rooted in the glorious his­tory of centuries, is to be hewn in pieces, ruined, dissipated into clouds so high that we can no longer see him, then chaos will be the result." This speech contains the last article of the Emperor's political creed; its principle illustrates his leading trait as a ruler. Originally published in Harper's New Monthly Magazine. May 1884.